To enter into the draw to win one of the 10 VIP subscriptions, simply leave a comment below stating that you live in the UK and letting me know what your favourite vanilla fragrances is. The competition closes on Tuesday 16 June 2015 Friday 19 June 2015¹ at 22:00. Entries after this date will not be counted. This competition is now closed. 1) The draw will close at 22:00 (GMT) on Tuesday 16 June 2015 Friday 19 June 2015²; 2) only one entry per person – repeat entries will not be counted; 3) only those based within the UK are able to enter; 4) the ten winners will be selected at random via random.org; 5) the winner will be announced on Wednesday 17 June 2015 Saturday 20 June 2015³; 6) winners will need to provide The Candy Perfume Boy with specific details (i.e. their name, address and email address), which will be shared with The Perfume Society; 7) if a winner has not made contact with The Candy Perfume Boy within seven days of announcement, The Candy Perfume Boy reserves the right to redraw; 8) the winners’ details will not be shared with any third parties, other than The Perfume Society; 9) the prize is a VIP subscription to The Perfume Society for ten winners with no cash alternative available; 10) relatives of persons associated with The Candy Perfume Boy cannot enter. Good, I’m glad we got that out of the way! ¹, ² & ³ – Giveaway deadline extended. 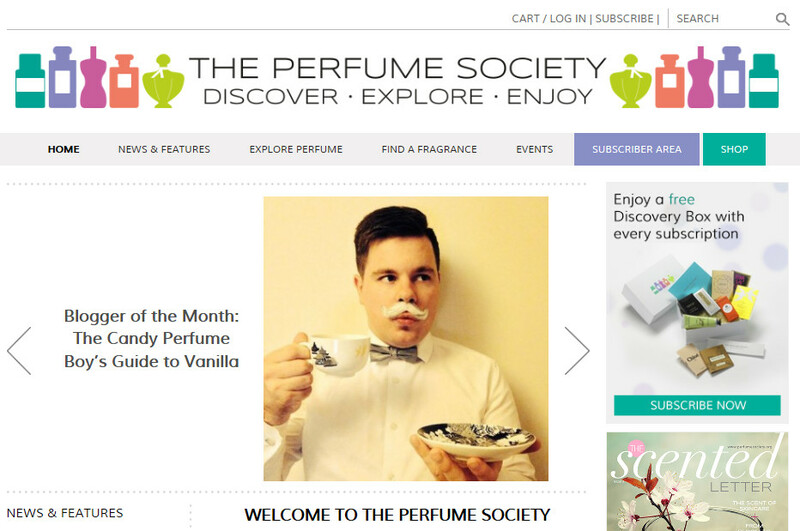 Posted in Competition and tagged Blogger of the Month, Competition, Giveaway, The Perfume Society. Bookmark the permalink. Those nice people at The Perfume Society know talent when they see it. Congratulations! Always good to be the first. I’d love to enter the draw please and confirm I live in the UK. I’ve struggled with vanilla frags but the closest I’ve got is Seven Billton Hearts by CB I Hate Perfume. Shame it costs close to Seven billion dollars, ha ha. Otherwise there’s always Shalimar for a more nuanced vanilla hit. I love 7BH as well. Such a true vanilla. Damn pricey though! You have been entered into the draw, my dear! Yes, that’s a very good one! You’ve been entered into the draw. Un Bois Vanille gets my vote. That reminds me, haven’t worn it for ages. It’s a good ‘un! You have been entered. Congrats – Here’s me never even knowing about The perfume society too – already a winner for that, thanks. I’m in the UK, got to be Tobacco Vanille (so far) for me, though I’m guessing I’m going to pick up some good tips for the sweet stuff from the other comments here.! Great choice, Tim! You have been entered into the draw. *I didn’t. But I wanted to. It’s gorgeous, isn’t it? Vanilla and jasmine. Yum! You have been entered! I really find super sweet vanilla gives me flashbacks to 1980s/1990s Body Shop, so I can’t really cope with it. I like L’artisan Perfumer Havana Vanille. Just wish I could afford a full bottle. Vanilla is best with a little bit of dryness, I agree. Havana Vanilla is a good one. You have been entered into the draw. Well having still not made my way to the US of A I am still a Black Country ex-pat residing in the outskirts of London, England, UK she says in a bad American accent (i.e. Zone 3 aka too far to walk home from what tourists regards as “London”). I need to try some of these Angela Flanders scents. You have been entered into the draw. Will give them a go! I hate to play favourites, but I’m enjoying the vanilla in Eau Duelle a lot at the moment. That’s today’s choice made, then 🙂 I’m UK based, so I’d love to be entered in the draw! That’s a good ‘un! You have been entered into the draw. Mine is Angel by Mugler! Gotta love Angel! You have been entered into the draw. Hi I’m in the UK as well and one of my favourite vanilla perfumes is Guerlain d SDV , yummy! Yummy! You have been entered into the draw. I’m actually not a great fan of straight vanillas (too many associations with sweet, sickly and heavy, like Angel), but am a big foan of the Perfume Society, so would have to go for something like Prada Candy, which is just on the edge of my acceptability range – still sweet, but the vanillic heart is tempered with ambery notes (which I love) and a woody depth. I can understand that, and Candy is a good choice based on your preferences.